Beautiful designs would not be possible without the pencil strokes of the designer, and the interpretation of the drafter. They form an inseparable duo, one tracing the outlines of a dream, the other giving these lines substance, each relying on the technical knowledge they acquired through many years within the company. 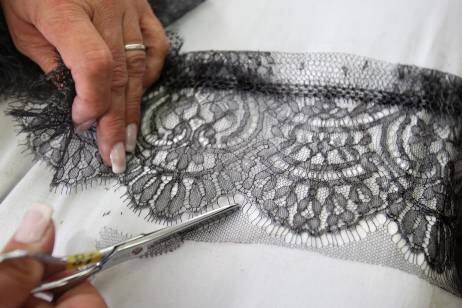 The art lies in combining them — and creating the future soul of the lace. 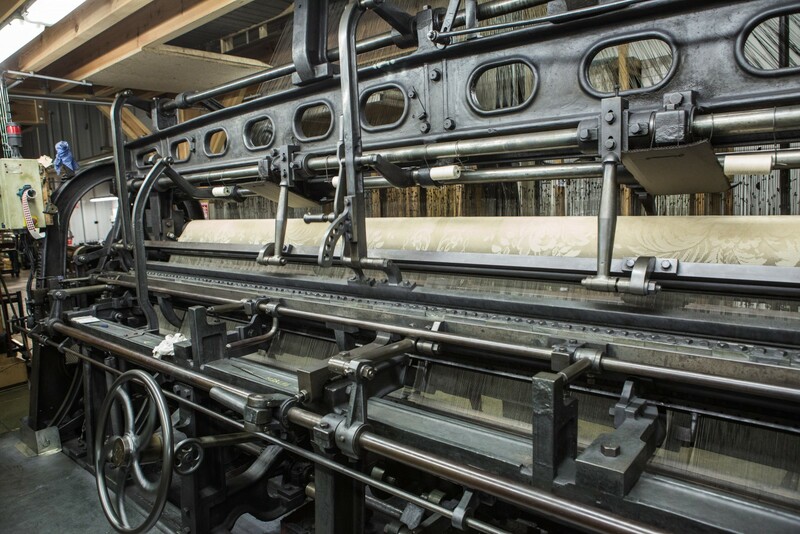 Generations of craftsmen have been working the Leavers and Bobbin looms with one goal in mind: weaving delicate lace and gossamer tulle out of several thousand miles of thread, using 5000 shuttles and 12 tons of cast iron. With heightened sensitivity, fullers become perfectly attuned to the music of their loom, and the lace they weave sparks emotion. 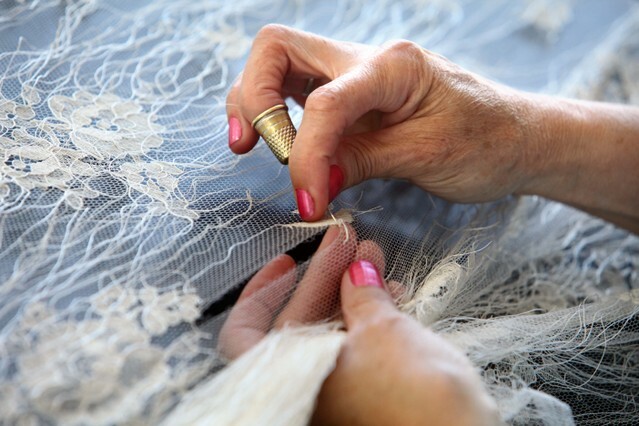 The lace and tulle always come off the loom with a few minor imperfections. 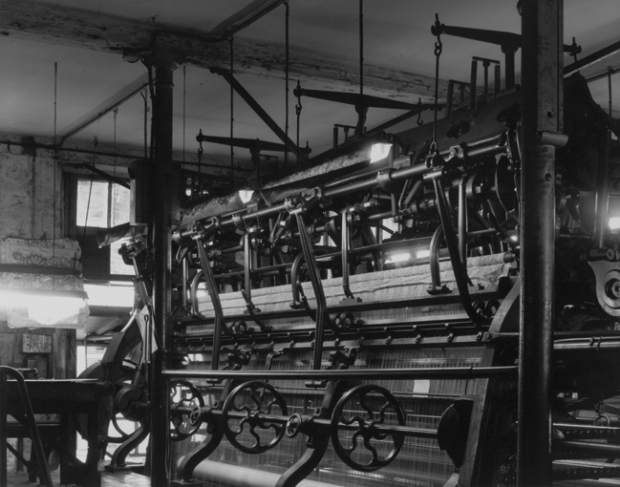 Scrutinous eyes search the forrest of threads and intricacies of the motifs to pick out flaws, ladders, bobbin holes, or warp threads. Then, armed with needles, menders reconstruct the missing stitches, sometimes spending over 15 hours on a single piece. And as if by magic, a perfect piece of lace emerges. Dyers are alchemists using color to miraculously transform drabness into brilliance. In their laboratory, these pipette-wielding sorcerers` apprentices mix pigments and chemicals to get just the right shade. Patiently steeping in gallons of water, the lace takes on it`s color and reveals all it`s glory. Many more steps await the lace before it leaves the factory. Some pieces will be sent to the clipping shop, where outlying threads that mask the design are cut and trimmed. Then to the scalloping, performed either on a machine or by hand with scissors, and then back again for another round of inspection and mending. One final inspection is performed before the lace is folded, packed and shopped throughout the world.